Background blur effect for decorating black bars in portrait videos/photos. Making your own video for Facebook can be interesting and you don’t have to be professional. But do you want to get more likes and comments from your friends about your video on Facebook? All you need are video shots/still pictures, music and a smart video maker - Wondershare Filmora9. With this video maker for Facebook, you can edit your own elements together quickly and easily and upload to Facebook automatically. Want to try it yourself? Just download Wondershare Filmora9, the easy-to-use yet powerful video maker, and go through the simple steps below to make your own video for Facebook. In then end, we will give you Facebook tips for making videos. In this article, we will illustrate the detailed steps for creating a Facebook video step by step. 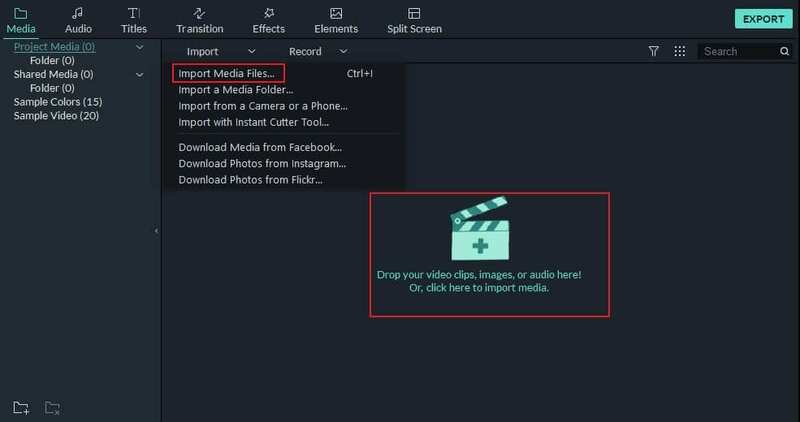 After launching Filmora9, click the “Import” button in the main menu, choose the files you have and click “Open” to import them into Filmora's Media Library. For your convenience, you can also directly drag and drop the files to the Media Library. Filmora9 allows you to preview your video footage at the right Preview window and snap a shot with the Camera icon without quality loss. After previewing, drag your files to the timeline. Put the files in the order you want them to appear in the final video, and your base sequence is now ready. Filmora9 is an easy-to-use yet powerful video editor, which allows you to do some basic video editing such as trimming, cropping, and splitting as well as some advanced video editing, including pan and zoom, play video in reverse, stabilize shaky videos, green screen, and advanced color tuning. You can crop, trim, cut, split and merge your video in a few clicks. Watch the video below to get detailed information. Tilt Shift, Face off, Mosaic, Jump Cut and more functions in Power Tool for you to try out. Make your footage look like a Hollywood film with color tuning tool, including the 3D LUT effect. Aside from the powerful editing features, there are more than 300 effects available in Filmora. You can add various overlays, filters, motion elements, transitions and much more to your video. Let’s have a look at the Toolbar. 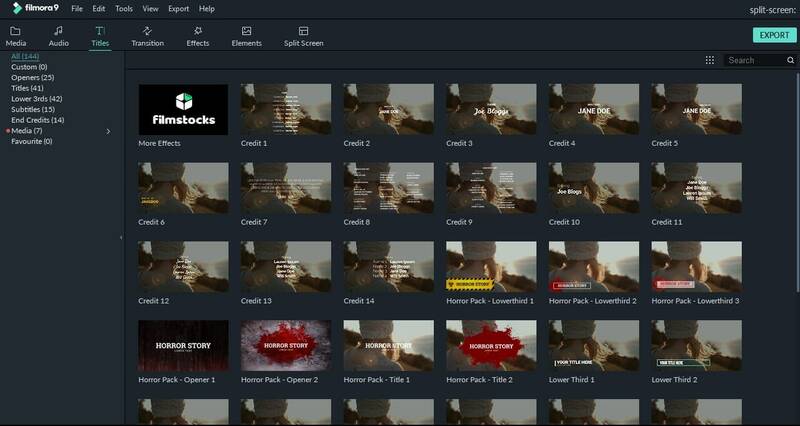 Filmora has more than 40 tracks built-in, and you can use them without worrying about the copyright concerns. What’s more, you can add your own music track and record your own voiceover to the video. To add the track to your Facebook video, just drag it to the timeline, and it will be placed in the sound track in the timeline. You can also download royalty free background music to use it for Facebook videos. Filmora9 provides various preset text and titles for your Facebook video. You can add an Opener title and End Credits, which is very convenient. Also, you can add Lower 3rds and subtitles. Just place the Playhead to the position where a title is needed, and then drag the desired title to the timeline and edit the title in the preview window. Transition effects are widely used in video editing software, they are normally used when one slide/clip replaces another one. It will make your Facebook video good looking and impressive. There are over 300 filters, overlays and elements embedded in Filmora that you can use for your Facebook video. What’s more, you can go to the Filmstock (Effects Store) to get specially designed Effects Sets, such as Beauty Set, Fashion Set, Fitness Set, Business Set, Food Set, Travel Set, Education Set and Holiday Set. What’s more, you can get some free Effects Packs just via sharing with your friends on Facebook. Let’s take a glimpse about the beauty set first. When the video making process is complete, all you need to do is to export and publish it on Facebook. In the export window, there are several options on the left panel. You can save it to your smartphone or in .mp4 format and upload to Facebook later. What’s more, you can share your video to YouTube, Vimeo or burn it to the DVD collection. To upload your video to Facebook, you need to know the video formats that are supported by Facebook, and choose the related video format. More than .mp4, Facebook also supports various video formats, including 3g2, 3gp, asf, div and more. If you want to save it to your computer, You can rename the video, change the location where you save it. Also, you can check the output size before conversion and adjust output quality by clicking Settings button. By default, the exported video is in Better level. In order to get the best quality, it is suggested to adjust the output settings as the same or similar as the original video. User's attention get away quickly, so it is important to gran their attention at the first 3 seconds. You can collect some beautiful photos and video to be your video introduction as people tend to get captured by beauty. Besides, you can also use some astonishing stuff to make raise the interest of viwers. All in all, in the age of lossing patient, you need to try your best to hook viwers. You need to know your goals no matter what you need to do. One video only needs one objective. Viwers will get lost if you want to have more stuff in your one video. The best part of goal is you can find your first idea when you don't know what to do. For creating Facebook vido, you need to be specific if you decide to make product video, which means the only goal is to shooting your product. Usually, long video needs more patience of viwers. It is not advised to make long video if your video quality is not high. For safty, under 30 seconds short video is the best. You need to encourge viwers to click or doing some action in the short video. How to import video/photo from Facebook/ Instagram for iOS? how do i upload the video to my facebook page rather than my personal profile? want video making software and tool for my facebook video. can this software is similar as i want?